up in as little as three or four years, the Irish Independent has learnt. shutters down for the final time. Allied Irish Banks (NYSE:AIB), Ireland’s second largest bank, reported on Friday its American Depositary Shares (ADS) have now ceased trading on the New York Stock Exchange. The Irish bank said its ADS shares, each representing ten ordinary shares, have been “deemed to be delisted”. Affected shareholders will be contacted with further information, the company said in statement. 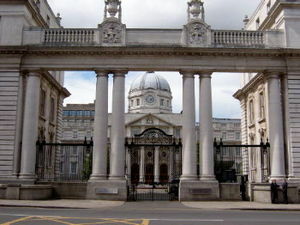 Allied’s board made the decision to delist in light of the increase in the Irish government‘s shareholding, completed with the help of the National Pension Reserve Fund Commission, which is required to make investments in credit institutions, as directed by the Ministry of Finance, to stabilize the economy and to prevent potential serious damage to the financial system in the state. At the end of July, the government bought EUR5 billion (US$7 billion) of new shares in the bank for 1 euro cent each, boosting its stake to near 100%. The bank received a 3.5 billion euro (US$5 billion) bailout from the Irish government in 2009 to rescue Ireland’s banking system, as its bad loans soared after the collapse of a decade-long real-estate bubble. AIB joins Anglo Irish Bank, EBS and Irish Nationwide as the fourth financial institution to be nationalized. Following the delisting, the bank will terminate the ADS facility by ending its ADS deposit agreement between AIB and the Bank of New York Mellon as depositary. Prior to the termination of its deposit agreement, and following delisting, AIB’s ADS will trade over the counter in the United States. The bank also plans to deregister its securities and terminate its obligations under the U.S. Securities Exchange Act of 1934, it said. What a sorry end for this Irish bank. The gangsters who are responsible are now grazing on lush pastures for the rest of their lives while the ordinary shareholders and taxpayers of Ireland have been raped, hoodwinked, and made fools of . Not one of these gangsters will ever see the inside of a jail and their bought off political contacts are still intact, ready to protect them if need be! Spend ! Spend ! Spend ! everything else fails’ to stop you out comes the killer stroke Health and Safety. all tragedy‘s National self delusion. another post I will tackle. small corner in a Sunday paper . This marks the official death of the Irish republic.